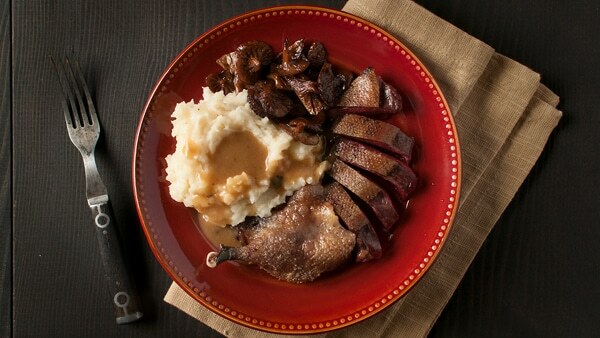 Duck season lasts 100 days here in California, so we eat a ton of ducks every autumn and winter. Whenever we bring home a pretty bird — one that is nicely fat and not too shot up — Holly and I often roast it whole. Most of the time we just carve it and eat it with salt, pepper and a little freshly squeezed lemon. But every now and again we crave gravy. Gravy is to sauce what jeans are to slacks. A sauce can be aloof, even austere. Gravy is your mama ringing the dinner bell. Maple-bourbon gravy is about as homey and as American as it gets, a meeting of North and South on the plate in the service of duck, venison, or really whatever you feel like pouring it over. I bet it would even be good with chicken. Duck, maple syrup and bourbon are three ingredients that really ought to spend more time together. The combination is plenty rich, with a sweetness that duck really benefits from; a touch of Tabasco balances things without making the gravy overly spicy. The sharp-eyed will notice some odd mushrooms on this plate. They are candy caps, which, when dried, smell strongly of maple syrup. Cooked fresh, like these, the flavor is muted. Since I had some from a recent mushrooming trip, I couldn’t resist adding them to the plate. Honestly, however, it made the dish a bit maple-heavy. I’d suggest something green in place of shrooms, like brussels sprouts or broccoli raab or even a nice salad. You need to roast a duck for this recipe, and there are lots of ways to do it. 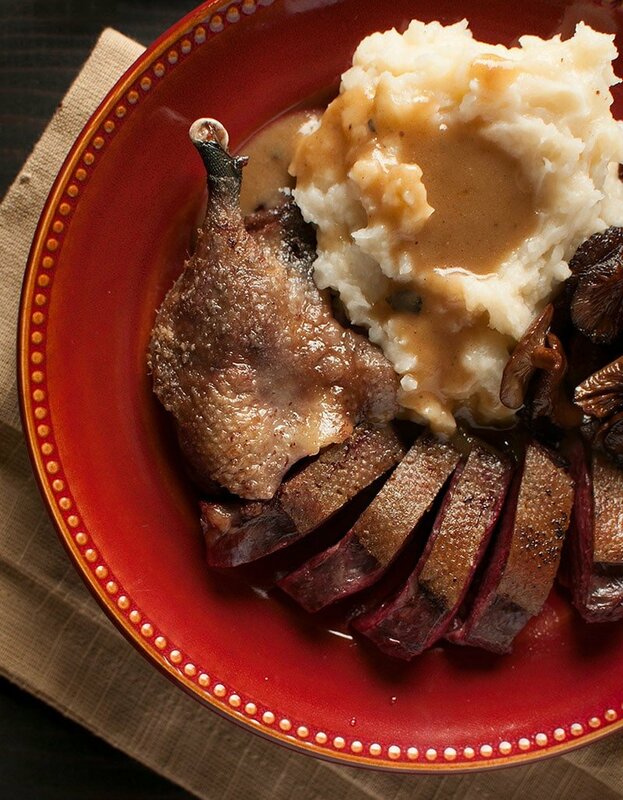 If you have a typical wild duck, you can quick roast it. If you have a domestic duck or a very fat wild one, you should slow-roast it. Here is how to fast roast a duck, and here's how to slow-roast a duck. Since I used a canvasback here, I will repeat the fast-roasting technique below. I served this with fresh candy cap mushrooms, which taste a little like maple syrup, but any fresh mushrooms will do, Or skip them and serve with a green vegetable of your choice. Since this has gravy, you really ought to have mashed or smashed potatoes here. Take the ducks out of the fridge and coat them with olive oil. Salt them well inside and out. Let them come towards room temperature for 30 minutes. Preheat the oven to 450°F. 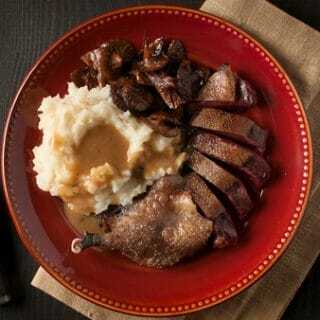 When the oven is ready, put the ducks breast side up in a cast-iron frying pan or other heavy, oven-proof pan. Make sure they do not touch each other. Roast until the breast meat hits about 135°F to 140°F, about 18 to 22 minutes. Remove the ducks from the oven and carve off the breasts. Set them skin side up on a cutting board. Return the ducks to the oven so you can cook the legs another 5 minutes. Take the ducks out of the oven again. Move the ducks to the cutting board and put the pan on the stovetop. Turn the heat to medium-high and crisp up the skin on the breasts. This should take about 2 to 4 minutes. Watch out for the pan handle -- it will be very hot! Once the breast skin is crisp, move it to the cutting board skin side up. You want 3 tablespoons of duck fat left in the pan. Spoon out extra or add some butter if you are short. Add the flour and mix well. Turn the heat to medium and cook the flour for 5 minutes, stirring occasionally. Add the bourbon. The roux will seize up, so be ready with the stock or water. Add it, stirring all the while, to combine. Bring to a gentle simmer. Pour in the maple syrup, Tabasco, and add salt and black pepper to taste. Simmer for for a minute or two. If the gravy has the right consistency, you are ready to add the cream. If it is too thick, add more stock. If it is too thin, let it boil down a bit. Once it is the consistency of Thanksgiving gravy, add the cream and cook 1 minute. Carve the ducks and give everyone some breast meat and legs. Serve with mashed potatoes, pouring the gravy over everything. Once made, the gravy will keep for a few days in the fridge, although it will set up solid when cold. It'll liquefy once you reheat it. 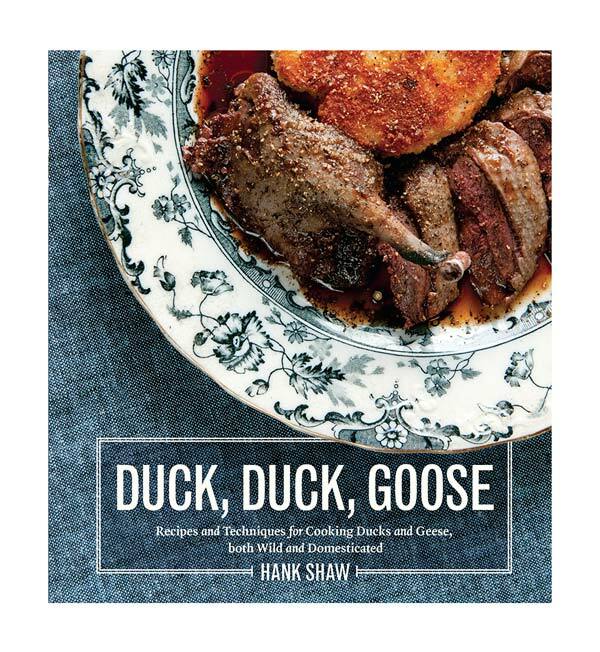 You'll find everything you need to know to master waterfowl in Hank Shaw's cookbook Duck, Duck, Goose. Hey Aaron: I tend to do this recipe with very fat ducks or domesticated ones, thus the removal of the breasts midstream. Could you cook them separately? Sure. More pans to deal with though. I was curious, have you ever substituted sour cream for the heavy cream? I have just found your site and LOVE it! No maple in Louisiana, so substituted 1/2 Steen’s cane syrup + 1/2 honey. Thanks, worked out good. Sid P.S. on pork, of all things.